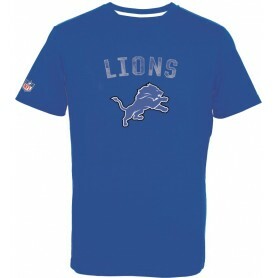 Gear up with Detroit Lions jerseys & merchandise available right here at Football America UK. We have large selection of Lions jerseys of all your favorite players in men's, women's, and kids' sizes. Elite replica youth jersey with silicone screen print name and numbers. The tagless neck label provides streamlined comfort whilst strategic ventilation offers breathability throughout the game. Inspired by what the players are wearing on the field and designed for total comfort, this Game Jersey is the ideal choice for a fan who wants to show their pride. All new Blaze Alternate Speed Mini helmets offer a new take on your favorite NFL team helmet. Blaze Alternates utilize different color schemes for the shells and facemasks with a unique paint technique that gives the colors a distinctive glow. Collect the entire league! Approx. 5" tall. Display your team pride on game day with this Official NFL Apparel Player Name & Number T-shirt from Majestic. 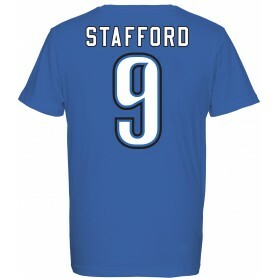 It features bold Detroit Lions graphics along with your favourite player's name and number on the back. The official team colour of Honolulu blue marks this cap out as a genuine piece of Detroit Lions merchandise. Exactly the same as the Lions pride wear on the sidelines, this is the official Sideline cap of the NFL. Newly designed Mini Size NFL Team Composite Football. Developed for recreational play and collectors. For all surfaces and weather conditions.